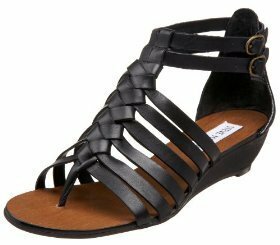 Steve Madden's 'Kasidy' t-strap wedge sandal is a great take on the gladiator trend. Get them in black, brown, purple or metallic for $79.95 at endless.com. Mossimo's 'Pollyann' woven wedge sandals look nearly identical to the Steve Maddens but cost a lot less. I tried these on in person and they look fab, if I hadn't just purchased two pairs of Cynthia Vincent for Target sandals, I would have bought these too! Pick them up in black or brown for $22.99 at target.com. Caldrea recently launched Caldrea Essential Collection for Target, a budget-friendly line of aromatherapy homekeeping products including dish soap, countertop cleaner, hand lotion, hand soap, hand balm, all-purpose cleaner, as well as home ambiance items including candles and reed diffusers. Scents for the homekeeping products, priced from $5.99 to $19.99, include Citron Ginger, Herbs of Provence, and Olive Oil. Home fragrance items, priced from $9.99 to $14.99 come scented in Citron Ginger, Water Lily, Pomegranate Fig, White Birch and Cypress Sage.